When you need security screws, security nuts or other security fasteners at best prices and available for next day delivery, look no further, you`ll find whatever you need here. Security Screws and Anti-Tamper Fasteners. Tamper proof "One Way screws" are typically installed using a conventional screwdriver, ...but once installed cannot be removed. Tamper resistant "Two Way screws" are Anti-tamper screws that can be removed at a later date if required ...but you will need a special matching security screwdriver tool to install or remove them. Which Security Screw is right for you? Our other tamper proof fasteners include various types of security nuts and tamper proof bolt enclosures, including: Shear-Nuts, Scroll-Nuts and Tufnuts which are all types of anti tamper nuts, while our Armour-Rings and NoGo security enclosures provide a simple and practical way to convert standard nuts, bolts or screws into tamper proof security fastenings. Security fasteners are manufactured from a range of materials and with a variety of finishes such as; Stainless Steel, BZP Steel (Bright Zinc Plated), Galvanised Steel and other specialist finishes. 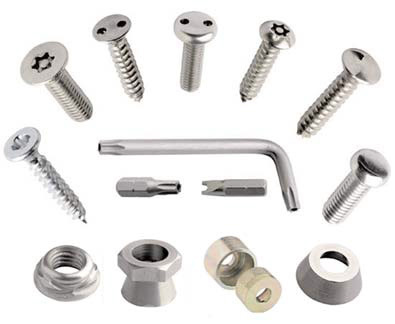 What are Security Screws and Fasteners used for? Security screws and tamperproof fastenings deliver practical, low cost protection for a wide range of items from safety railings, to park benches and access hatches …and lots more. They provide a simple way to deter thieves and vandals and offer a practical solution to the problem of unauthorised relocation of items. Clutch Head Security Screws are the original, low cost, one way screws that are installed with a standard flat blade screwdriver.